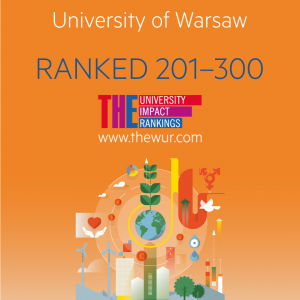 Times Higher Education developed a new ranking that included more than 450 universities from 76 countries. It aims to measure institutions’ success in delivering the United Nations’ Sustainable Development Goals (SDGs). There are 17 SDGs, e.g. ending poverty and hunger; promoting good health and well-being and quality education; achieving gender equality and economic growth; and revitalising global partnerships. In the pilot ranking, authors of the ranking focused on a subset of 11 SDGs: global partnerships as a mandatory field, in addition to good health and well-being; quality education; gender equality; decent work and economic growth; industry, innovation and infrastructure; reduced inequalities; sustainable cities and communities; responsible consumption and production; climate action; and peace, justice and strong institutions. If it comes to the university performance in delivering SDG 17 Partnerships for the Goals, UW took the 65th place.